NANOSKIN AUTOSCRUB Brilliant Shine Kit works fast and achieves professional results with the new advanced rubber polymer technology, which replaces the use of clay bars. With easy grip hand application, it safely and easily removes paint over spray, water spots, fresh tree sap, rail dust and other bonded surface contaminants from the surface of automotive paint, glass, moldings and plastic. Unlike the clay bar, the AUTOSCRUB Sponge can be cleaned by simply rinsing off the accumulated contaminates with water. If you drop the AUTOSCRUB Sponge on the ground, no worries, just rinse the sponge clean and you're ready to keep using it. Easy glides allows for sturdy and controlled handling, unlike clay bars where constant reshaping is required. *For surface prep. in auto body shop environment , use with NANOSKIN GLIDE Instant Spray Lubricant (not included). *For surface smoothness, use with NANOSKIN SMOOTH Instant Detail Spray Lubricant (not included). 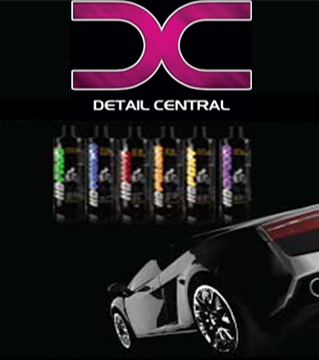 *To achieve best result on the paint, use with NANOSKIN NANO SHOCK Hydrophobic Spray Wax & Sealant(not included). Cleaner/Activator (not included) then follow with RAIN Glass Sealant (not included). 3 Easy Steps to a smooth-as-glass finish! Used as an AUTOSCRUB Lubricant. Removes minor contaminants, dust, fingerprints, bugs, and more, restoring the brilliance of a showroom finish. Unlike the clay bar, the AUTOSCRUB Sponge can be cleaned by simply rinsing off the accumulated contaminates with water. Easy glides allows for sturdy and controlled handling, unlike clay bars where constant reshaping is required. Through the use of advanced hydrophobic polymer formula, NANOSKIN has created a spray polymer that actually repels water, dissipates static, and adds additional protection to your finish. NOTE: HE will continue to cure for up to 24 hours. A premium dual-sided microfiber towel to provide amazing shine on all finishes. Delivers amazing scratch free results quickly and easily. For best results, complete all steps in the shade on a cool surface that has been washed with a NANOSKIN car wash such as BUBBLE BATH Wash & Shine Shampoo (not included). DO NOT work on the surface over 144°F. Sufficient lubrication is crucial to the AUTOSCRUB application. AUTOSCRUB Sponge is not solvent resistant. Remove tar & grease before application. Step 1: Mist freshly washed surface with sufficient SMOOTH Instant Detail Spray. Step 2: Rub & glide AUTOSCRUB Sponge over lubricated surface back and forth with NO PRESSURE to remove bonded contaminants. Step 3: Wipe surface dry with Premium Microfiber Towel.